ONLINE BOAT REGISTRATION NOW AVAILABLE!!! Please follow the link above to pre-register your watercraft. Permits will still need to be paid for and picked up at Riddle Point Park, or the Lake Lemon Marina. Lake Lemon is located in the beautiful rolling hills of south-central Indiana just 10 miles northeast of Bloomington, Indiana. The scenic and tranquil setting attracts boaters and fishermen from as far as Kentucky and northern Indiana. In 1953 Lake Lemon, was built to serve as a drinking water reservoir and natural resource venue for the City of Bloomington’s expanding population. Lake lemon was used as the primary drinking water source for the City of Bloomington until the late 1960’s. Currently the reservoir serves as Bloomington’s back up water supply. 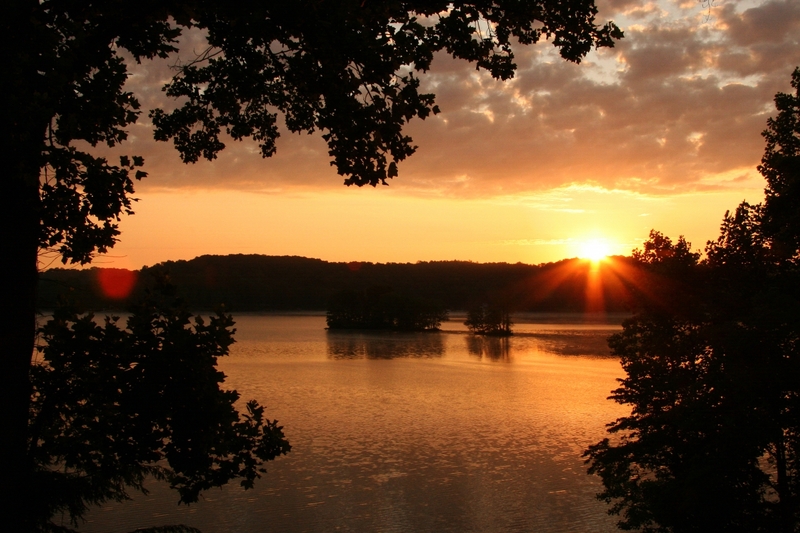 Lake Lemon is the 11th largest lake and 7th largest public reservoir in Indiana with a size of 1,650 acres, 24 miles of shoreline, and an average depth of 9.7 feet. The Lake Lemon watershed drains approximately 70 square miles of land. In the late 1980’s, due to the financial burden of an unused water supply, the City of Bloomington Utilities began to look for a group interested in managing the reservoir. The Lake Lemon Conservancy District (LLCD) was formed in 1995 after strenuous grass root efforts lead by lake residents Earl Eberle, Larry Ritter and Bud Howard. The LLCD is a very active organization, including seven elected volunteer directors comprised of Lake Lemon landowners. Though Indiana law only requires conservancy districts to hold four (4) board meetings a year, the LLCD host monthly meetings as it is more conducive to carrying on business and getting things accomplished. Despite its young age, the LLCD has accomplished a myriad of important tasks. Nuisance wildlife and vegetation are monitored and controlled on an ongoing basis. Nutrient and water quality levels are measured on a weekly and annual basis to ensure the highest degree of water quality and to minimize health risks associated with public bodies of water. In the spring of 2010, the LLCD purchased the necessary equipment for the district to manage a dredging and shore line stabilization (Rip-Rap) program entitled the Lake Lemon Restoration Project. This marks a major milestone for LLCD as these operations were previously contracted. Noted in Indiana Game & Fish magazine as one of Indiana’s top bass fisheries, Lake Lemon is an ideal spot for the casual recreation seeker and top fishermen alike. Get out, explore, and enjoy the beauty of Lake Lemon. To view the final conceptual Sediment Mitigation Design Report, please click THIS LINK. Copyright ©2010 Lake Lemon Conservancy District. All rights reserved. Site design & code by : Blue Tide Productions.